Have you ever had a dessert that was so good, so perfect-tasting that you described it as heavenly? I have. And today, I would like to introduce you to Italian Baking Secrets, by a certain someone who may have a thing or two to say about heaven, Father Giuseppe Orsini. Father Orsini is the author of six books in all; with this one being number six. While retired, he is quite active in his community and still ministers on occasion in an Italian parish in New Jersey. 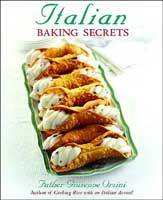 While Father Orsini may deal in matters from high above, Italian Baking Secrets is written in an extremely charming, down-to-earth manner. From the chapter titled A Brief History of Bread, to Techniques for Baking Bread, through and beyond Introduction to Pastries, Father Orsini patiently guides the reader through all the nuances of making wonderful bread and pastries. There are five chapters in total devoted to bread alone. And for those who like to have holiday themed parties you will rejoice in the chapters Easter in Italy and Italian Family Christmas Memories. Having lived in Paris, I often gravitate toward sweets that combine fruits and nuts. Father Orsini does just this with his Petrali cookies which contain a mixture of figs, raisins, almonds, walnuts, chocolate and honey. On the savory side of bread there is Pane al Formaggio (cheese bread). The combination of Parmesan and pecorino cheeses and olive oil sounds more interesting than simple cheese sticks. I would be remiss if I did not mention grandma in this review and her Torta della Nonna (Grandmother’s Cake). It uses Splenda for those on a low-sugar diet, pignoli (pine-nuts) and rum, of course.